Willow Valley sits at an elevation of 6700'. With it's narrows, mandatory swims, boulder hopping, scrambling and some route finding this is a great place for people to get a taste of canyoneering in a great day hike. My buddy and I did this hike on Labor Day. Neither of us had been here before so we set out early to try and find the canyon. Follow the directions given below. Park your car at the tank (which will be on your right) or park as we did under the big ponderosa on the other side of the road opposite the tank. To start the hike and the small bit of route finding head towards the tank. You can walk around the tank opposite the road and you'll find a cowboy gate where the fence goes up and over some large rocks. If you look you can find it easily. Close the gate once through and pick your way down the canyon. There is no well defined trail here so just route find your way down the canyon. A hint: Follow the bottom of the canyon don't try and go on the slopes the New Mexico Locust bush is razor sharp and prominent on the slopes, it's less in the canyon bottom itself. Just above the confluence with Willow Valley there is a 10 ft. cliff which you must either down climb or go around and get cut up in the Locust bush. If you look to the left you can down climb this easily (and I'm no climber either). Once in Willow Valley it's a short ways before you come to three to four swims, the first two you can climb around which are described in Williams book "Canyoneering Arizona" as 5.1 climbs. So just swim for it. It's deep water in all of the pools. The first pool is an easy swim and a flat rock to start your swim off of too. The second pool is a little trickier, you scramble down onto wet rock and go right in. The third pool is a mandatory swim and this one is real tricky as once you scramble down it gets real narrow and the rock sort of goes straight down into the water. There is a ledge you can slide over and onto and start from there or just go feet first into the water. We decided on the ledge. You scramble over a rock and slide down onto the ledge which is slick and under water, if you fall to your right you fall into a 5 foot pool, if you fall to your left (which is the swimming path) then you fall into deep water so be careful, it's only about 4 feet wide for about 10 feet or so. The last pool Williams book said it was a wade but it was way deeper than any wade. We found a way around this one on creek right up a rock slope, over, and kind of spider man your way around a narrow ledge then jump from there onto the beach. You'll finally come to the origin of West Clear Creek. It's easy to recognize as another stream (Clover Creek) joins with Willow Valley forming West Clear Creek. It's a wide open area with cobble stones everywhere. About a half mile more you come to the Maxwell Trail. It's not marked so pay attention and the trail will be on creek right going up and away just before the canyon makes a sharp left. The Maxwell trail is 0.6 miles up to the trail head and to your shuttle vehicle if you left one, or mountain bike, or road walking (3 miles) back to your car at the start of the hike. 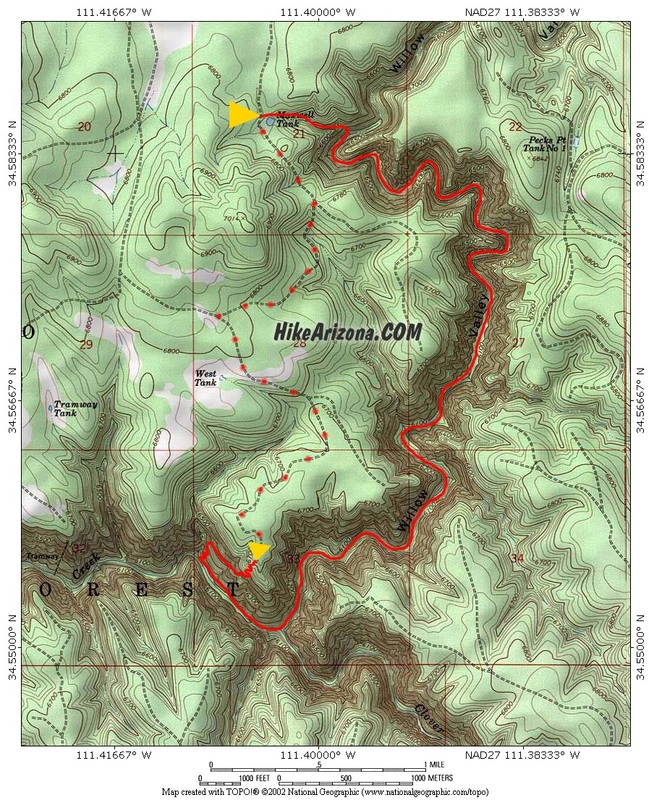 This is a great hike to get your feet wet literally and figuratively to see if you are up to canyoneering. Just make sure it's not going to rain especially in the narrow parts, it rained on us with a thunderstorm in the afternoon and lasted the whole way home. Not cool when lightning bolts and heavy rains are all around you. Outside temperatures should be around 85 to 95 degrees due to the cold waters you'll be swimming in or wading in. It was 86 degrees when we went and I would have preferred 90 degrees or so. Have fun, pick up after yourselves and those "other" non appreciating people of the canyon. We saw no one on this entire hike just what they left behind, no trash up in the narrows all the way down until the campsites appeared. Take Hwy 260 East out of Camp Verde and drive until you come to Hwy 87 go left or North bound. Right around the area of Clints well and the Happy Jack information center you'll see a sign for Forest Hwy 3. Turn left (if going northbound on Hwy 87)onto Forest Hwy 3. In about ten miles or so you'll turn left onto FR 81, this is not easy to see but it's not hard either unless your going eighty miles an hour. It's a major forest road. After driving on FR 81 for 3.1 miles veer left onto FR 81E and drive another 3.8 miles to the junction of FR693, stay left and in another 0.5 miles you'll come to the Maxwell Tank road and the Maxwell Trail road. If you want to leave a shuttle vehicle (a mountain bike is good for this one) bear right onto the Maxwell Trail road and leave your vehicle or mountain bike after 1.5 miles at the canyon rim and trail head. If not, bear left onto Maxwell Tank road and drive 0.9 miles and bear left, Maxwell Tank is another 0.4 miles.